South Africa’s Giniel de Villiers and German co-driver Dirk von Zitzewitz climbed to third overall behind Frenchman Stéphane Peterhansel and Qatari Nasser Saleh Al-Attiyah on the fourth 288km special stage of the Dakar Rally between Nazca and Arequipa in Peru on Tuesday. But the Argentinean duo of Lucio Alvarez and Ronnie Graue lost over three hours on the punishing desert special stage and fell from third to 27th in the overall standings at the wheel of their Overdrive Racing Toyota Hilux. The Argentinean damaged a suspension arm and lost valuable time waiting for his assistance truck to make emergency repairs. Both Overdrive Racing and the Toyota Imperial South Africa Team lost a car each before the fourth stage started out of Nazca. Both Peter van Merksteijn and Duncan Vos had rolled on the previous special and retired, although Vos had been able to complete the special before withdrawing from the race and 25th position. The fourth stage began close to Nazca and finished near the Pacific Ocean, before a liaison section along the Panamericana Sur guided teams to the overnight halt in Arequipa. The special offered a variety of terrain and altitude and had been run in a similar format in the opposite direction last year. One of the highlights was a two-kilometre downhill descent early on, although the stage included numerous ascents. Peterhansel began the day with a 6min 3sec overall lead over Nasser Saleh Al-Attiyah, but there was more controversy regarding Carlos Sainz’s Sentinel issue from the second stage. Further discussions took place between ERTF tracking and race officials and it was decided to again take the time from the Spaniard on the grounds that the back-up device was working correctly. The Spaniard dropped to 10th as a result and promoted De Villiers to fifth place. Al-Attiyah won his second successive special to reduce Peterhansel’s overall advantage to 5min 16sec and De Villiers drove well in the remaining Toyota Imperial South Africa Hilux to record the fourth fastest time and move into the final podium position. Robbie Gordon rolled his Hummer 29km into the day’s stage and Carlos Sainz also hit further mechanical trouble. 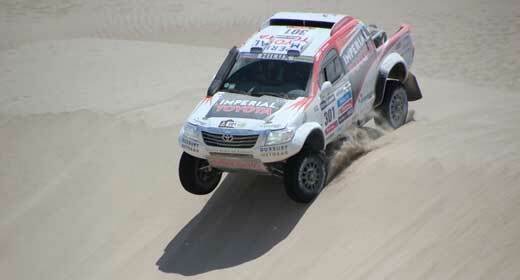 The Polish duo of Adam Malysz and Rafal Marton lost substantial time stuck in the soft sand on the third stage in their Overdrive Toyota but they began the fourth stage in 21st overall nonetheless and the 18th quickest time into Arequipa moved the Poles up to 19th in the general classification. Australian Geoff Olholm and British co-driver Jonathon Aston were classified in 18th at the start of the fourth stage in their Cairns Coconut Resort-supported Toyota and they were also in fine form to record the 14th quickest time and rise to 12th in the overall results. Venezuelans Nunzio Coffaro and Daniel Meneses started the fourth stage from 33rd overall in their Team Azimut Toyota and continued their run of superb form following first stage delays. They set the seventh fastest time and have now moved up from 146th to 20th in just three stages. Szymon Ruta and co-driver Laurent Lichtleuchter were badly delayed in the sand dunes into Nazca in their Orlen-backed Hilux and started the stage at the rear of the field and had to battle their way passed numerous back markers in the choking dust. South Africans Duncan Vos and Robert Howie had finished the third stage in 25th overall, but the Toyota Imperial South Africa Team duo had rolled their Hilux in the stage into Nazca and were unable to continue after the roll cage was damaged. Dutchman Peter van Merksteijn and Belgian co-driver Eddy Chevallier were also forced out of the rally after rolling their Overdrive Toyota Hilux in the dunes between Pisco and Nazca. Neither crew member was injured in the incident, but they too were unable to continue after the car was completely destroyed in the incident. Overdrive Racing has received additional valuable support from sponsors Toyota Belgium, Mistral, Donaldson Filtration and Michelin. The Overdrive Racing Toyota chassis were built in Belgium in conjunction with Toyota Motorsport South Africa and Hallspeed and are powered by the 4.6-litre V8 engine that conforms to the latest FIA regulations. Overdrive is based at Villers-le-Bouillet, near Huy, in Belgium. Tomorrow (Wednesday), the rally passes from Peru into Chile with a stage from Arequipa to the border town of Arica – the town used as a rest day halt on the 2011 Dakar Rally. 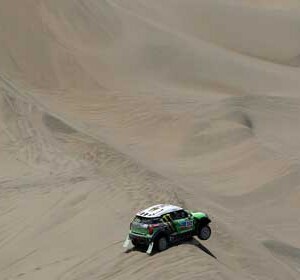 A short, final 172km special stage in Peru, finishing to the southwest of Tacna, will be included in a route of 509km. The motorcycles will race over a slightly shorter special stage.